What Is In Store For Super GT Fans Abroad This Weekend? If you want to know how I became engrossed in the Super GT Series, that fascination starts with video games. But before there was a Super GT World, before I’d been asked to join the DSC team, way back before my hair was various shades of blue and purple, there was simply no way to watch the races outside of ripping race broadcasts from the host broadcaster. There were infrequent attempts to bring Super GT to an audience outside of Japan. 30-minute digest shows in the early 2000s. Broadcasts on Motors TV later in the decade. Then, Radio Show Limited and NISMO put their resources together to broadcast the 2014 Suzuka 1000km, the start of Super GT on NISMO TV, which continued on through 2015, 2016, then after NISMO TV took over sole production responsibilities for 2017 and 2018. But the first two races of the 2016 Super GT season weren’t carried on NISMO TV. A snag in the process of securing the broadcast rights meant that the season-opening Okayama round, and one of the big two events, the Fuji 500km, wouldn’t be shown live outside of Japan. I’d hoped that this would be the last time that we’d ever have to talk about a Super GT race simply not being shown to a world audience. Yet, with just over 24 hours as of publication until the green flag waves for Sunday’s 82-lap Okayama GT 300km Race, we’re not sure if we’re going to get a live streaming broadcast, and the likelihood that a 59th minute of the 11th-hour deal will be done isn’t great. Trust me when I say that from the bottom of my heart, that Super GT is my passion, my special interest, and it is, for my money, the best sports car racing series that exists. But there are regressive ideas that are holding the series back at a time when it needs it the very least. NISMO TV has undergone a rebranding this offseason, with Nissan selling off the channel that is now known as Let’s Go Racing henceforth. 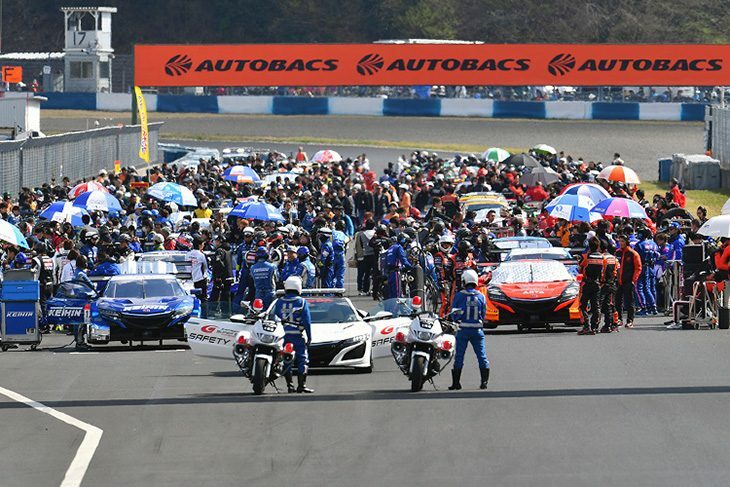 They plan on carrying more Japanese racing content including, for the first time, the Super Formula Championship and All-Japan Formula 3 Championship, in which many of Super GT’s top stars race. 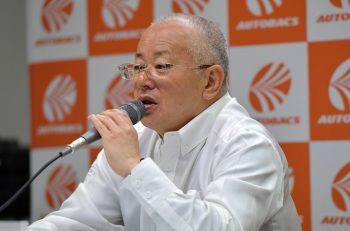 They also plan on carrying the 2019 Super GT season as they have for the past four and a half seasons, but it’s unlikely that a deal is going to be done to have the critical season-opening round on the channel live. It’s been discussed on Twitter that a tape-delayed, “presented as live” broadcast could come together in the weeks to come. Speaking of the weeks to come, Super GT announced that for the first time, full race uploads will be going on their channel in both Japanese and English language versions, which is a genuinely positive development! but those will be uploaded, according to the series itself, three weeks after the races happen. This means that, if a deal isn’t done to have Super GT broadcast live on Sunday, both established and potential Super GT fans around the world won’t get to see Sunday’s race in its entirety, via legal and ethical means, until the 5th of May, after the next race, the Fuji 500km, will have already happened. And of course, the series has no plans to stream the race itself on their own YouTube channel, let alone the Practice or Qualifying sessions, in their entirety. Being a national series, the home market will always come first, and Super GT has no shortage of content being delivered to its fans based in Japan. 2019 will continue the series’ long-term television deal with premium sports network J Sports, with every session available to watch either on television or streaming devices, with the wonderful personnel they have in place, lead commentator Sascha Boeckle, colour commentators like Takuya Yura and Hideo Fukuyama, and pit reporters Jiro Takahashi and Shima Takeuchi. Super GT isn’t obligated to promote outside of Japan, yet, here they are in 2019 – with a decorated and respected Formula 1 World Champion, Jenson Button, as a reigning co-champion of its premier class, one of the biggest stars of the sport both at home and abroad. With a highly-anticipated Exchange Race with the Deutsche Tourenwagen Masters (DTM) series set for November. With drivers representing fourteen different countries on the grid outside of Japan, across both GT500 and GT300. And yet, even as the series is producing its own original video content for international audiences, some within the series don’t believe that an international live broadcast of their amazing on-track product is worth any serious time or investment. There are other reflections of this regressive mindset within the GT Association: They have a live timing and scoring app which has been on the market for years. In 2019, the live timing functions – made free to everyone in other sports car racing series – are stuffed behind a one-time charge of eight US dollars. It remains iOS exclusive, meaning no access for Android users, and no desktop access. Meanwhile, Super Formula’s live timing is free, available on iOS and Android, and desktop – and it’s developed by the same company on the same exact system! The GT Association isn’t out to completely shut their product off to the rest of the world, but not having a consistent live product that’s accessible outside of Japan gives off the appearance of its own Sakoku, or period of isolation. IMSA, for instance, is a national championship that would also have no real reason to make its live races accessible to all, if they were to use the GTA’s logic – yet arguably, it’s easier to follow their races outside the United States than within them! The regional Le Mans Series of Europe and Asia also follow suit, both easily accessible the world over. Hell, even inside of Japan, Super Taikyu can owe its recent surge in popularity to the fact that they are broadcasting their races freely to the world, in full, and putting in a live timing system to make it even easier to follow the races even if they don’t have an English commentary team. Outside the bounds of motor racing, New Japan Pro Wrestling has found itself a genuine market for their product outside of Japan thanks to the advent of their over-the-top streaming service NJPW World, leading to them being one of the biggest non-WWE wrestling promotions in the West. Similarly, to use the example of a non-kayfabe sporting event, Premier League Football is becoming a regular fixture in the weekend morning routine of American sports fans thanks to their broadcast partners in the States. All of this is easily attainable, yet in the eyes of some in the GT Association, it’s not worth their time – and that’s hurtful in a time where the series themselves are trying to the best of the efforts that they wish to put forward to promote the series. There are no plans as of the time of writing for us to get to tune in to see the duo of Sam Collins and Rob Barff bring their unique, relaxed, interactive broadcasts to thousands of viewers live around the world early Sunday morning. And at the moment, the only way to watch the race live would be through illicit sources, or to wait three weeks and after the very next race for the series to put the full race on their YouTube channel post-mortem. 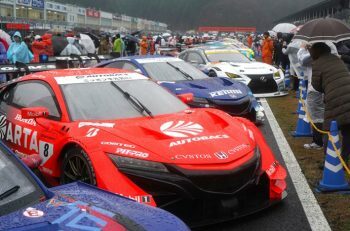 We will do our best to try and sort something out with many other foreign SuperGT drivers. This sort of short sighted attitude demonstrates a leadership group who are out of touch with modern media consumption behaviours and will inevitably damage the series long term. Disappointing as personally I would watch more if I could access it. Reading @rjoconnell piece – just about to be posted on DSC – ref lack of @SUPERGT_JP live streaming – beyond disappointing – have tracked interest in the Series for years & can tell the organisers very clearly that interest has been growing rapidly – Massive own goal! I have commentated on a number of Super GT races over the past couple of years with Rob and Sam and am very disappointed by this. It is a great series with some fantastic racing and for it to fall aside like this outside Japan is very sad indeed. Same! I love the series and I will continue to support and report about it as long as I breath, but they really make it hard sometimes with their narrow mindset towards their international audience. It’s weird that a 3rd party has to do all the work for them. Surely it can’t be paranoia that further exposure outside of Japan would leave Super GT vulnerable to drastic changes that would compromise the character of the series? It wouldn’t make sense, the draw of Super GT now is what it has that other series don’t: Healthy manufacturer support, great variety in both of its classes, amazing cars, an open tyre war, and some of the best drivers in the world, not just the European names we know, but the Japanese drivers who can stand toe-to-toe with them and have their own incredible stories to tell, from Naoki Yamamoto to Nobuteru Taniguchi. There is a magic to live sport that cannot be replicated in post-production, especially in an age where everything is accessible as it happens thanks to the advent of streaming and social media. How will they get DTM fans excited about the change to Class One regulations if they can’t see the series that pioneered it? How will the fans of Jenson Button stay invested in their favourite driver through 5-minute highlight reels and time-delayed YouTube uploads? Super GT has its base well covered at home. If it refuses to see out a resolution for the fans that clearly demand it abroad, they will have committed a terrible act of self-sabotage, and alienate the fans who they claim to want to bring in by the thousands. It’s quite hard for me to profess that a series is worth seeing if the series itself does not wish to be seen abroad in what is starting to become a fraught relationship between Super GT and its international fanbase. I’m going to try my best to do what I can to get everyone’s attention towards the series all the same.